We all depend on groundwater. The single largest source of water that Bangalore has created apart from Cauvery, is actually a hole in the ground! We are pulling water that has been down there for hundreds of years, that is somebody else’s right as much as it is ours. Some use Cauvery water or groundwater to flush the toilets, while some others are not getting water even to drink. Where does ground water come from? We all live above common aquifers – spaces between soil particles and cracks, fissures and faults in the rocks. The spread of aquifer is independant of property or administrative boundaries. Everytime we pull out water from the ground, we are possibly denying someone else of their source of water. Ground water is rainwater that has trickled down and percolated into the earth. The Deccan plateau broadly has three layers – top soil on which plants grow, a ‘weathered zone’ beneath the top soil and finally hard rock. This is therefore called ‘Hard rock’ geology – particularly important from a groundwater perspective. The weathered zone looks like soil but is actually rock ground down to powder – this layer acts like a sponge and holds water in between particles. Water percolating further down fills up the fissures/ cracks/ faults in the hard rock. When it rains and water percolates down, it passes through the weathered zone and then into the hard rock fissures. A large connected set of fissures, in effect one single body of water under the ground, is called an aquifer. Aquifers in the hard rock and are referred to as ‘confined aquifers’ as they are under pressure. Water in the weathered zone is shallow and is referred to as shallow unconfined aquifer. Open wells up to depths of around 80 feet in Bangalore were meant to access water in the shallow unconfined aquifers. Over time these have been dried out, except in certain parts of Bangalore. After open wells started drying, people started digging borewells which were going deeper and picking up water from the fissures in rocks – or from confined aquifers. Is your STP working or is it just getting rid of your waste water? Do you do regular checks of STP output water? Is the contract with your STP operator linked to quality of output? Does he have metrics of performance? Can you reuse waste water? Can you separate out different kinds of waste water? Does your flushing need good quality water? Can you treat waste water to good enough quality that you can recharge it? It’s difficult to predict where you get water in deeper confined aquifers – at depths of 100 to 650 feet, there are a lot of fissures through which water trickles in. There is no way to predict, other than testing each site. When you dig a borewell and start pulling water out, you are emptying the water in the aquifers which is a finite amount. The process by which water enters into these fissures is called recharge. This can be natural or artificial. Since there is only a finite amount of water underneath, we cannot endlessly keep pumping out water. As a city, we need to understand how much water is available. This is not an easy task. All the residents in an area need to share where they have dug the bore well, how deep did it go, at what depth did they get water, etc. The data collected across the city can help get a better picture of the city’s aquifers. 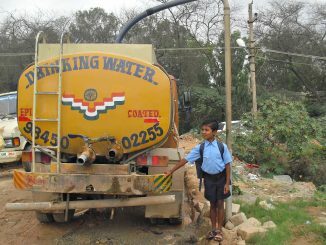 Ground water tables tend to be rising in central parts of Bangalore, where pipes are laid. This is said to be due to leakages. Recharge from leakages has been large enough that even the shallow aquifers in these parts of Bangalore are getting full (eg: Frazer town around Ulsoor lake). However this leakage is getting mixed with the leakage from the sewage pipes. So though the ground water levels are going up, the quality is not good. In outer areas of Bangalore, groundwater levels are going down. How can we recharge water? There are two kinds of recharge you can do. One option is to put water back directly – direct recharge; this kind of recharge is a huge operation. One tanker of water can get sucked in within five minutes. Alternatively you can have open well recharge. You pour water into open wells (shallow layers) and let the earth seep water down. You use the shallow aquifer as the recharge points. The recharge rates can be as good as 4,000-5,000 litres within 12 hours in north Bangalore to a 4,000-5,000 litre well taking a week to recharge. There is a difference between both kinds of recharges. If the water is even a little contaminated, in direct recharge, you have no control; you will end up contaminating the entire aquifer at one shot. In the case of open wells, that is shallow aquifer recharge, the earth has the capacity to kill the bacteria. Open wells at Ferns Paradise. File pic. How does BWSSB supply water? The water is pumped and transported over a distance of 100 km, from the Krishna Raja Sagar dam in Mysore. The power required to pump this water is enormous and it is citizen’s tax money – Rs 300 crores — that finances this. BWSSB charges do not account for the total cost you pay. There are 6,60,355 BWSSB connections in the city, as on January 31, 2013. The BWSSB estimates the demand for the water to be 1125 million litres per day and claims to supply 900 MLD. But the distribution losses amounts to 460 MLD. In the Cauvery Phase II, stage IV project, an additional 500 MLD (million litres per day) is to be supplied to the entire city. 1) Leakage in the taps: We tend to ignore those small drops of water constantly trickling down to the bathroom or kitchen sync, as the magnitude does not look bigger. We also tend to forget the proverb – small drops of water together make an ocean. 3) Washing cars with hosepipe: Yes, car looks clean and good when washed in running water. But can’t you use a sponge and a bucket of water and achieve the same effect? 4) Showers: Bathing in the shower is something everyone craves for; but have you ever checked the water level before and after the shower-bath and compared it to the simple one-bucket-of-water bath? Check and you will see the difference. 5) Over-watering the garden: Over-watering? Yes. Gardens survive even with sprinklers; but we waste water by pouring it indiscriminately on the plants, while the excess water flows out of the pot unless you keep a plate under the pot. Keeping a plastic/ earthen plate helps retain the water and feed it back to the pot as it gets dried up. 6) Washing machines: They drink a lot of water. The machines with water-saving mode save water to some extent. But if you can, it’s always best to hand-wash the clothes, to save some water and get some good physical exercise. 7) Water filters: The high-end filters that promise clean water with less TDS (total dissolved solvents) level, in the process of filtering, drain out almost twice the water they filter. The drained water is a bit hard; collect it and use it for flushing the toilets, car wash or gardening. 8) Flushing the toilet: Flushing the western commodes takes lot of water. Unless you use the partial flush option whenever possible, you will be wasting lot of water. The water tankers that drip all along the way are a common sight in the city. The washing of the front yard with lot of water in the morning is a habit for many. They are used to the old times which did not have any water problem, hence not able to connect to the severe shortage the city is facing. Can we use treated water? Though the city has 14 Sewage Treatment Plants with a capacity to treat 721 Million Litres per Day(MLD), only 302 MLD of sewage water gets treated. However with STPs being mandatory in apartments built post-2007, treated water is used for gardening in many places. Many apartments are now using the same for flushing too, using a twin-line system. Cost of treated water is way lower than fresh water. An STP in good running condition produces good quality treated water that can be used for gardening, flushing and certain other purposes like basement cleaning. For this, the piping system needs to be designed such that the inlet going into every flush is connected to the treated water supply. Water is usually pumped into a special overhead tank, from which the pipes can be rerouted. Waste sludge: Gets composted and can be used as fertilizer. Waste water: Can be used for landscaping – but don’t just indiscriminately irrigate because you have waste water available. Also using for landscaping means that people can get in contact with it when in gardens/park. Therefore COD/BOD (chemical/ biochemical Oxygen demand) counts should be adequately low and it should be treated well enough. Flushing: Using treated waste water for flushing is a great idea for two reasons. Firstly it reduces demand for fresh water. Also, because it is coming in people’s toilets it ensures the community is treating the waste water to good quality – All the people now know the quality of output of waste water. In very ideal cases, when quality of treatment is extremely good (back to potable quality water) it can even be recharged.What goes around comes around. Bangalore Ground water has high nitrates (upto 100-150) The waste water you throw out comes back into your borewell. The central government’s ground water authority had issued a major order in November 2012, banning digging of commercial borewells. When the baton passed to the state authority this April, everything broke. 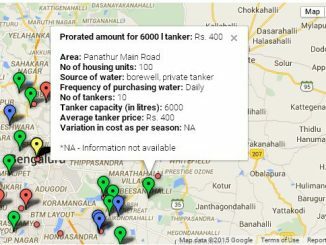 Check how much people in Bengaluru are paying for a tanker of water, and share how much do you pay! The information is excellent.To implement this,Govt,BWSSB and local citizen association should come forward to educate citizens.This educating program should be done regularly.To this financial back up from Govt.and BWSSB is necessary.Citizen association (Regd) must request the Govt to fund,the fund should be allocate on pre estimate and account of expenditure to be audited.The electronic media, news papers and workshops and seminars to be conduct in all areas.By this economy of water usage may be achive.. Rain water usable is 616.30 Liters per day, So concentrating on this also save water and can be reused, with Injection well too. A beautifu article. It gives knowledge on the importance of this life saving drops which we should stop wasting and protect for our own future use. We’re coming back to you on this soon, G V. There is something in the works on this. Lovely article ! Explains things very clearly for lay people like me. Nice diagram too. In the next article, could you please mention the extent of subsidy on water ? How much does it cost to cleanse and pump the water to the consumer, and how much the consumer pays.